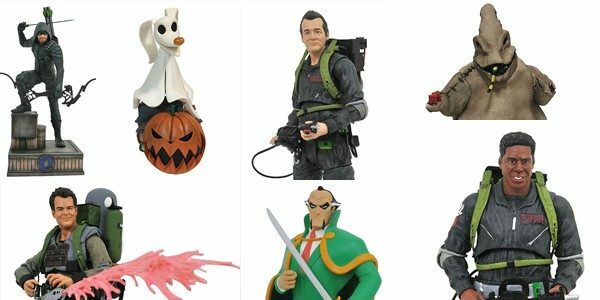 The Ghostbusters and Tim Burton’s The Nightmare Before Christmas team up with Arrow, the Flash and Ra’s Al Ghul to offer a variety of items, from action figures to PVC dioramas to resin busts! Find a store near you at comicshoplocator.com, or order online at shop.diamondselecttoys.com! Ghostbusters Select Action Figures Series 8 Asst. A Diamond Select Toys release! The boys are back in town! Three new 7-inch scale action figures are joining the ultimate Ghostbusters Action Figure line, each with a piece of the massive firehouse diorama! Based on the sequel Ghostbusters 2, this series features We’re Back Peter in his grey jumpsuit, We’re Back Winston in his grey jumpsuit, and Slime-Blower Ray Stanz with his massive equipment! Each 7-inch figure comes packaged in the famous Select action figure packaging, ready for display with side-panel artwork for shelf reference. And each contributes to the firehouse doors, getting you that much closer to having a Ghostbusters HQ in your own home! Sculpted by Gentle Giant Studios! (Item #MAR182428, SRP: $24.99/ea. A Diamond Select Toys Release! Turn your shelf into a nightmare! The cast of Tim Burton’s Nightmare Before Christmas continues to populate DST’s line of resin busts. Featuring the movie’s most popular characters atop diorama bases, the line continues with villain Oogie Boogie and Jack Skellington’s dog, Zero. Oogie measures approximately 7 inches tall atop a pedestal inspired by his lair, while Zero stands approximately 4 inches tall atop a pile of books and a jack o’lantern. Each bust is limited to 3,000 pieces and includes a numbered certificate of authenticity in a full-color box. Sculpted by Joe Menna!